The history of Atlantic City reads much like a dramatic novel. Since its incorporation in 1854, this New Jersey resort town has seen its fair share of triumph and tribulation. By 1874, a deal with the railroad had over 500,000 passengers coming to the city by rail each year. With a growing tourism market, hotel construction began. By the end of the year, Atlantic City’s United States Hotel was the largest in the country. The famous boardwalk was constructed during peak season in order to help hotel owners keep sand out of their lobbies, and the story of America’s Favorite Playground was off to a booming start. With the 1920s came what many historians consider to be a golden age in Atlantic City’s history. As the federal government passed new laws banning the consumption of alcohol, the back rooms of the city’s nightclubs and restaurants took on new life as illegal bars. Local officials, on the payroll of organized criminals, looked the other way as smuggled alcohol helped the city reach new heights in terms of tourism. The end of prohibition in 1933, however, put a dramatic end to the city’s new lifeline. Following World War II, Atlantic City became a hotbed for poverty, crime and corruption. More popular personal automobiles, cheaper jet service to beach destinations and even the increase of suburban homes are all attributed with a role in the city’s rapid decline. Most of the popular resorts from the golden age suffered from embarrassingly high vacancy rates, and many were demolished during the 1970s and 1980s. The resurgence of New Jersey’s most famous destination, however, was just around the corner. In 1976, New Jersey voters approved legalized gambling in an effort to revitalize the city. Almost immediately after the legislation passed, the Chalfonte-Haddon Hall Hotel was converted into the Resorts International, becoming the first legal casino in the eastern United States. Tourism intensive areas flourished, and investor Donald Trump brought major boxing bouts to the city, giving Atlantic City a boost in nationwide attention. By the end of the decade, the New Jersey resort town had grown into one of the country’s most popular tourist destinations. The development of Las Vegas and additional legalized gambling options in the surrounding area put Atlantic City into another period of turmoil beginning in the early 1990s. In the early 2000s, the city’s tourism numbers began to drop due to a lack of options beyond gambling. Despite plans for a number of new resorts, the economic conditions of the late 2000s recession led to the cancellation of building plans, with landmarks of the city such as the Sands Atlantic City closing their doors for good. As of September 2014, the greater Atlantic City area posted one of the highest unemployment rates in the entire country. 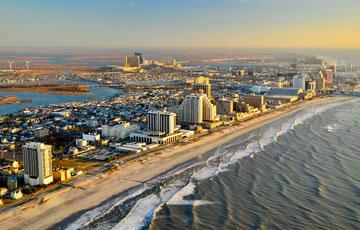 Atlantic City’s next recovery in now in the planning phase. As one of the country’s most resilient cities, investors are standing by to see from where the next big financial boom will come.